Yeah, fell off the wagon before I could even pick up any momentum. Also, drinking tea in a frantic attempt to keep calm. And falling under the lull of Derrida and Nietzsche. A really close friend in London had her babies today. Yes, babies -- twins. Murano and Burano --- blame this on my being in Venice in July. Hey, we could call them Mu and Bu. A and B --- the boring option, which I said out loud in order to compel the parents-to-be to think of better nicknames. When I received the text message announcing the babies' arrival today, they were referred to as #1 and #2. I wonder if that's on their hospital wristbands. * If they were fraternal twins, I would immediately suggest Huck and Molly, of course. I said I was going to blog daily, and then yesterday, the third day, I failed. In lieu of that, enjoy this not-quite-in-focus picture I took yesterday with my iPhone. That's tempeh, a Malay soybean patty that's tasty when fried with veggies. The friend who was hosting dinner bought it in Chinatown here in London. 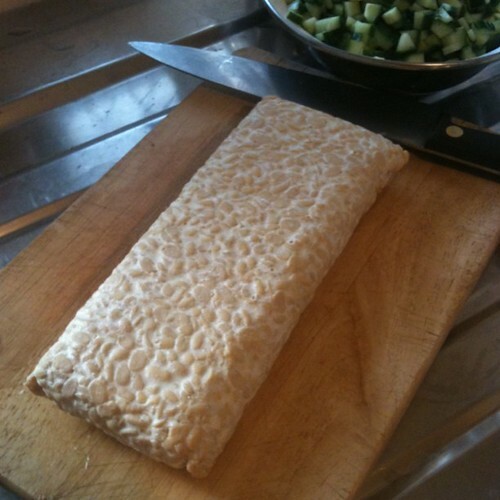 I've never actually dealt with tempeh before, so even cutting up the block I was like: Cubed, you say? How big? Like this? Like this? It turned out all right. He also made a delightful chicken curry, and we all had some bak zhang (glutinous rice dumplings with meat filling), two from our clandestine Singapore suppliers, two from my aunt in Yorkshire. * I've never been a diehard bak zhang fan, but eating some at the same friend's dinner party a few months ago really made my cravings and the tastebuds kick into high gear. I've been researching recipes with another friend back home, and I'll have to add to the list the one included in my friend Cheryl's new book about Singapore food, A Tiger in the Kitchen. The tricky part is the technique of wrapping the dumplings in bamboo leaves. We might have to cajole a friend's aunt to coach us, failing which we'll consult the step-by-step pictorial guide on Cheryl's blog. I just made myself hungry at 11:20 pm by writing this post. Edited to add (12 July): My cousin nardac, via Twitter, points me to umami's blog, where there's a post on how to wrap dumplings. * Technically, the aunt is the wife of a first cousin once removed, but all those removed cousinships have always confused me and I've grown up calling her "Aunt" and the cousin "Uncle". I don't even know what the appropriate Cantonese terms would be. I tweet more often than I blog these days, and sometimes I wish there were more universally-understood abbreviations so I could type less and say more within the 140-character straitjacket. My mum left London for home yesterday, which means my vacation/slacking-off time is officially over. I have seven weeks to hammer out a dissertation in order to complete my master's degree, so naturally, again, everyone's like, "You're a writer! 10,000-12,000 words --- pish posh! "* If you were a fly on the wall at my dissertation supervision meetings and heard me blather on in about five different directions, you'd be less quick to reassure me, I tell you. Speaking of which, the following decision might make me a dinosaur in internet terms, but what the heck: besides the dissertation deadline, I think I'm going to set myself the additional challenge of blogging daily over the next seven weeks. I need to exercise the personal-unpaid-writing muscle and I need to be less lazy about it. It's like going to the gym! --- for writing. Some of my favourite writers-who-blog (such as John Scalzi and Mridu Khullar, for instance) blog everyday. No reason I can't too (except for the aforementioned laziness and my long-time susceptibility to procrastination, on which see A.L. Kennedy in the Guardian (via @davechua)). Busy news day today: News of the World phone hacking scandal/closure unfolding apace, the people of Egypt figuring out their future, and those of Malaysia too, and South Sudan is the world's newest state (and the 193rd to be recognised by the United Nations). We live in exciting times. * Okay, no one actually says "pish posh". “@stormgrl: Ok, I have Google + - now how do I use it properly?" That's how you use it. You tweet about it.